From the Newark Advocate. In the picture, Shawna Winterbotham, of Newark, makes a campaign sign Sept. 23 for her run for secretary of the People First Group. HEATH, N.J. -- Shena Lemons wants her voice to be heard. And as a person with a developmental disability, she has a lot to say about improving the lives of disabled Licking County residents. "I want people to know how to help people with disabilities in the work place, in church and in the community," she said. So Lemons jumped at the chance to join People First, a new self-advocacy group sponsored by the Licking County Board of Developmental Disabilities. The board conducted informational meetings Tuesday and Thursday at its Service Coordination office in Heath to share information about the new group. More than 30 people attended, including Lemons. "I see a lot of need for advocacy," she said. "And I think it will be fun." The original People First chapter in Ohio was started in 1998 after a group of people with developmental disabilities came together to make their voices heard, said Sadie Hunter, executive director of People First of Ohio. The group received funding from the Ohio Department of Developmental Disabilities and the Developmental Disabilities Council. Chapters began forming around the state. Licking County's People First chapter is the 60th in Ohio, Hunter said. Every chapter is run by its members --people with developmental disabilities. 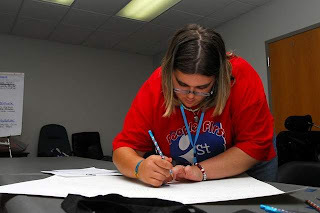 People First of Ohio provides training for each chapter so members can learn how to run their meetings, express themselves and be self-advocates. "The goal is for people with developmental disabilities to learn about their rights and responsibilities, make changes to laws that affect their lives and advocate for family and friends," Hunter said. "We want them to be active community members"
With Election Day coming up, Hunter said many People First chapters are helping with Project Vote, a campaign to get traditionally underrepresented people to the polls. Others participate in service projects such as preparing care boxes for troops overseas. They also take a stand on state and federal legislation that affects those with developmental disabilities. Members of People First spoke out in support of Senate Bill 79, which passed in May 2009, removing the term mental retardation from the titles of state agencies, county boards and other entities, Hunter said. It will be up to the members of the Licking County chapter of People First to decide what their focus will be. Hunter said. "A lot of people with disabilities are used to people telling them what to do," she said. "But this is theirs." The Licking County board has been working on starting a chapter of People First for a few years, said Chanda Busse, director of service coordination for the board. "With the everyday business of trying to meet people's needs, you can lose focus on what's important to the people," Busse said. "This provides a mode for them to tell us what is important." During the first two meetings, members learned how to run the chapter and made nominations for officers. The nominees made campaign posters and an election will be conducted Thursday, said Heather Odendahl, public information manager for the board. Once officers are elected, they will decide when the group will meet and choose advisers from the Licking County board to help them with projects and activities. "When they are speaking for themselves, it's a lot more powerful than others speaking for them," Odendahl said. "It's more impactful." By participating in People First, Licking County residents will be able to empower themselves and educate others about developmental disabilities, Hunter said. "We want people to treat them as people first and see their disability as something about them, (not who they are)," she said.